I`m having an issue to run WebODM on docker toolbox. My host system is Windows 10 Home and I followed the steps in https://github.com/OpenDroneMap/WebODM for installation. I had searched on the forums and on web, but find nothing about this problem. Make sure to issue a ./webodm.sh down if you decide to change the environment. As a result, WebODM is not accessible from browser (Tested with all browsers I have here), but there are no error messages and no success messages. The execution is immediately stopped and I don`t know where to look for a log that helps in this situation. But didn`t have sucess with them. Here is a screenshot from my docker terminal. Could someone please help with this problem? I`m seriously stucked here. What URL are you trying to open? Remember it’s http://dockerip:8000 where dockerip is the output of docker-machine ip. I want to apologize, because I wasn’t so clear in my previous description. Usually, after we run the command ./webodm.sh start, the script executes many operations and prints some response on terminal. 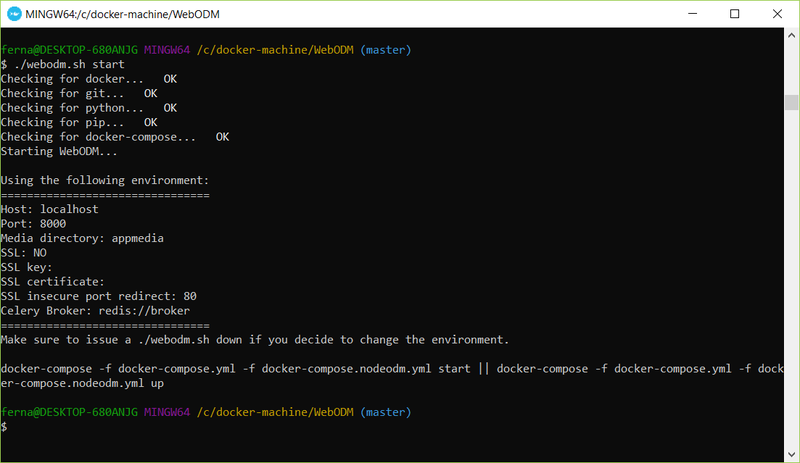 But in my new PC, the command stops before printing any message under docker-compose -f docker-compose.yml -f docker-compose.nodeodm.yml start || docker-compose -f docker-compose.yml -f docker-compose.nodeodm.yml up. There are no errors, no warnings, no success messages. I don’t have a clue about whats happening in my new PC. I think after running ./webodm.sh start the messages saying 'this' ..done 'that' ...done, or some error, would appear in my terminal, but not is happening, like in the screenshot of my first post. This happened to me after I changed the vmdsk location inside Virtualbox GUI. I only changed the virtual disk and not the accompanying files in the .docker folder where the Vdisk originally was located. Not sure this has anything to do with the issue, but I comment this here for if this helps you and me solve this issue. I issued the restart command and it is back on again.